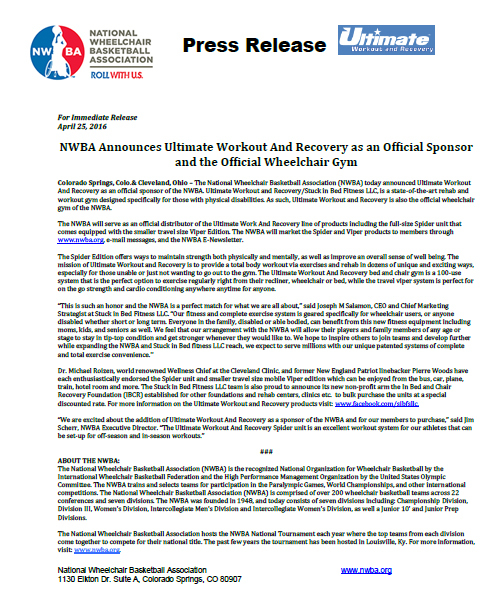 The National Wheelchair Basketball Association (NWBA) today announced Ultimate Workout and Recovery as an official sponsor of the NWBA. Ultimate Workout and Recovery/Stuck in Bed Fitness LLC, is a state-of-the-art rehab and workout gym designed specifically for those with physical disabilities. As such, Ultimate Workout and Recovery is also the official wheelchair gym of the NWBA. The NWBA will serve as an official distributor of the Ultimate Work and Recovery line of products including the full-size Spider unit. The NWBA will market the Spider product to members through www.nwba.org, e-mail messages, and the NWBA E-Newsletter. The Spider Edition offers ways to maintain strength both physically and mentally, as well as improve an overall sense of well being. The mission of Ultimate Workout and Recovery is to provide a total body workout via exercises and rehab in dozens of unique and exciting ways, especially for those unable or just not wanting to go out. The Ultimate Workout and Recovery gym is a 100-use system that is the perfect option to exercise regularly right from their recliner, wheelchair or bed. Dr. Michael Roizen, world renowned Wellness Chief at the Cleveland Clinic, and former New England Patriot linebacker Pierre Woods have each enthusiastically endorsed the Spider unit. The Stuck in Bed Fitness LLC team is also proud to announce its new Foundation set up for other Foundations/Rehab Clinic Centers to bulk purchase the units at a special discounted. For more information on the Ultimate Workout and Recovery products visit: www.facebook.com/sibfsllc. “We are excited about the addition of Ultimate Workout and Recovery as a sponsor of the NWBA and for our members to purchase the Ultimate Workout and Recovery Spider unit. It is an excellent workout system for our athletes that can be set-up for off-season and in-season workouts,” said Jim Scherr, NWBA Executive Director.